I often cook in phases where I will cook something until I have exhausted all possible variations, I'm finally sick of eating whatever the phase is, or everyone else is begging me to stop making what ever it is. I think a lot of bloggers do that, there tend to be lots of the same thing being made at the same time. Right now that phase for me is flavored nuts, which involve using egg whites, and I couldn't figure out anything to do with the 2 yolks so I had been throwing them out. Then I remembered that I need egg yolks to make Ice Cream so I saved them this time and with the wonderful Organic Raspberries I picked up I made some Raspberry Ice Cream. It was a great way to not waste. And I think I might be on an Ice Cream phase now but I need to be staying focused on the changes that will soon be taking place around here. You will all just have to wait and see! In a medium size saucepan heat the half and half and sugar until the sugar granules have disappeared. Pour the cream into a large bowl and set a mesh strainer over the top of it. In another bowl whisk together the egg yolks. Pour some of the warm half and half mixture into the egg yolks, whisking constantly. Add in the rest of the half and half mixture and whisk to combine. Pour this back into the saucepan and stir constantly over medium heat until the mixture coats the back of the spoon. Pour the mixture through the strainer into the cream and mix to combine. Add in the raspberry puree and stir until cool over an ice bath. 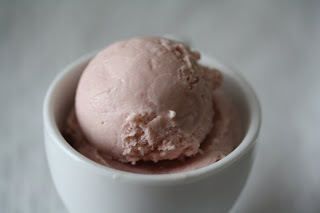 Chill in the fridge for 2-4 hours and then churn as directed by your ice cream machine. Note - to make the puree I blended 4 cups of raspberries and then pushed them through a strainer to remove the seeds. 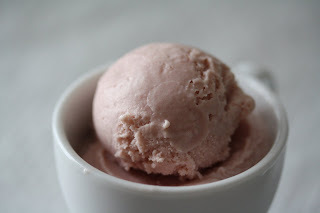 Adapted from Raspberry Ice Cream by David Lebovitz in The Perfect Scoop. Great way to use your raspberries! Looks so creamy and delicious! mmm…raspberry ice cream is SOOO good. the varieties at the store almost always contain bits of chocolate, which is good, but sometimes i just want pure raspberries! gorgeous scoops—keep ‘em coming! Leftover egg yolks are a good reason to make some lemon curd. So easy & delicious! I just use lemon concentrate rather than fresh lemon juice but still yummy! Good for you Katie. I wish everyone felt that way instead of wasting so much food. This ice cream is just the ticket for these hot summer days...I love raspberries. Raspberry is definitely in my top ten icecream flavors. Such a nice balance between tart/sweet.